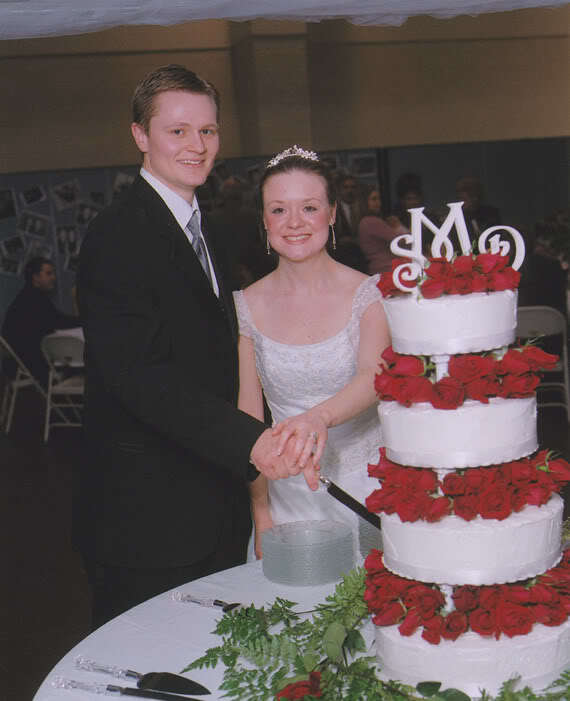 6 years ago this past January, I married my best friend. We had a beautiful wedding cake made by my wonderful little mother. I wanted a simple cake with lots deep red roses, edged out with satin ribbon, and topped with our initials. My mother delivered with this beautiful, perfect cake. Whew! we looked all young and fresh-faced...lol. But anyhow, see the wedding cake topper? Yep, I saved that. And today I decided to do something with it. I found this in my opinion ugly frame that I already had. So I took the frame apart, took out the inside matting, and took out the glass. Next I brushed on a coat of Kilz Odorless Primer. Then I sprayed on a coat of Valspar Brushed Nickel. Afterwards my frame was looking like this. So next I took my wedding topper and cut the "spikes" off the bottom. The spikes were so it would stand up straight in our cake. I just took my handsaw and carefully used it in one direction. I held these delicate little pieces of wood tightly against the miter box and prayed they didn't splinter apart while I sawed. Thankfully, it worked. Then I used my B&D Mouse Sander to smooth the edges. You can see the spikes that were on them in the pic below. I then gathered other supplies. I picked up a cheap $7 white 16x20 double mat framed to 11x14 from Michaels. I also had planned on grabbing posterboard, but instead got this paper from the paint section. I can't remember what the paper is called but it was $2.00 for a posterboard size piece and they had it in a ton of colors. I chose green because I think it goes well with other things in our bedroom. 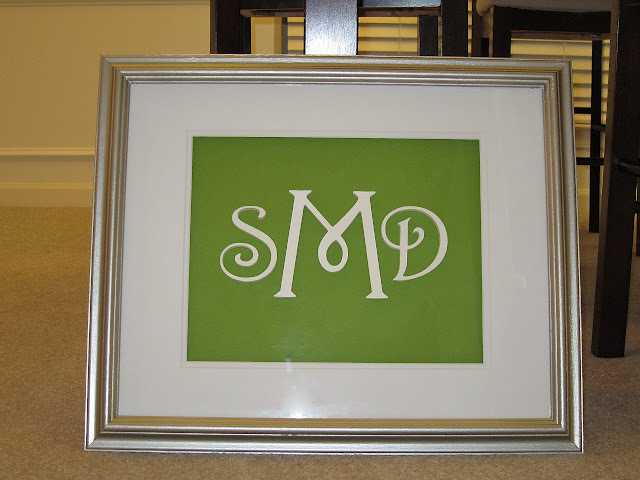 I then cut the green paper to fit and taped it to the cardboard backing of the frame. I then hot glued the wedding topper initials to the center of the green paper. I also took wooden shims (leftover from another project, but they are about $3 for a huge pack of them at Lowes) and hot glued them around the outer edges of the green paper. I did this so that it would make the backing stand away from the mat and glass. Since the frame originally had those 6 little frames inside the 1 big frame it was pretty deep and so the shims worked like a charm. I did this as close to the outer edges of the green paper as possible, so they would be behind the mat and wouldn't show. Then I put the mat in the frame followed by the green paper. And VOILA! 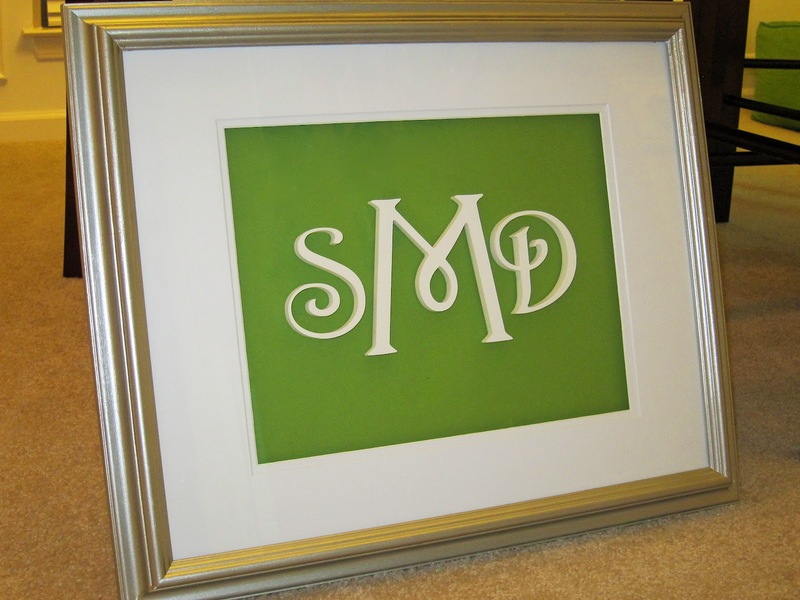 Framed wedding topper initials! Perfect artwork for our bedroom! This is a great idea and turned out to well! I love the shadow box effect that you created. Great job! Super cute, and thanks for linking up! There is a little problem with your tagline that you added for my contest, it doesn't link to anywhere! The sponsor found the problem, so I just want to make sure you are properly entered. Could you copy and paste the tagline one more time? Thanks and good luck! I think I got it fixed...blogspot was giving me fits with that tagline...lol. I separated it into the bottom of the post and think it works now. I had to link it myself though as the links within the tagline would never work for some reason. Hope that works! Oh, this is precious!! It looks so good, and it is so sentimental! Do you happen to have a picture of how the shims look on the back?? I am a "visual" person, and I can't quite picture it!! You are a doll! So lovely. So great to have you be a part of Seasonal Sundays. Hope you'll join me this week too.